iLearning at San Domenico School: Show me the Nervous System! Show me the Nervous System! 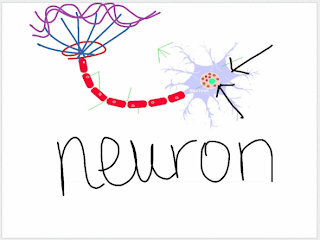 In order to review what they learned during their unit on the Nervous system students needed to be able to explain various concepts such as the anatomy of the brain, how we hear, see, smell and taste, and neurons. In addition they needed to understand the more complicated physiology of how neurons communicate, create electrical signals and transfer information chemically across the synapse. As they say, "If you can teach it, then you know it." That is why students were put into pairs or threes and given a topic in which to make a ShowMe. Then the links to the ShowMe presentations were added to their review sheets in the class Box (@BoxHQ) folder for everyone to be able to watch as much as they want while they are reviewing for the unit test.